BRAUN - ALGERII Sarace norum urbis fortissimae. BRAUN, G. / HOGENBERG, F. - ALGERII Sarace norum urbis fortissimae. ALGERII Sarace norum urbis fortissimae. - BRAUN, G. / HOGENBERG, F.
Title : ALGERII Sarace norum urbis fortissimae.. Size : 13.6 x 19.3 inches. / 34.5 x 49.0 cm. 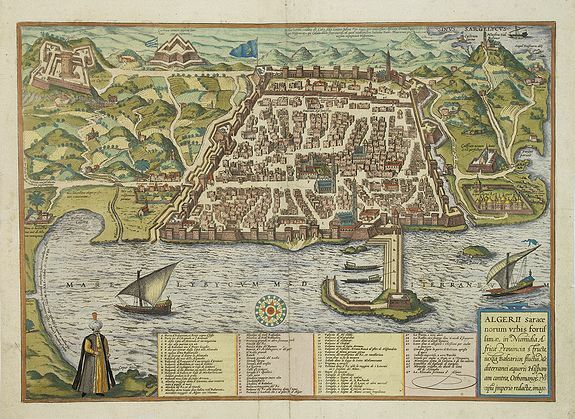 Description :An attractive town-plan of the Alger, including a numbered key legend in the lower part. From the greatest publication in this genre!. The "Civitates" was compiled and written by George Braun, Canon of Cologne Cathedral. Braun gathered together vast amounts of information and draft plans to produce over 500 city views/maps published in six parts between 1572 and 1617. Condition : Paper slightly age toned. French text on verso.